When we think of scientific advancement, Hollywood has taught us to envisage the obsessed scientist working alone in the lab late at night, hunched over a microscope or painstakingly pipetting chemicals into test tubes. Suddenly, one of the tubes turns green and starts fizzing and he’s got his breakthrough formula made. Scientists lovingly call this the Breakthrough Myth. The unsexy reality is that it usually takes the work of multiple teams of researchers, operating out of different labs around the world, over the course of decades, for new treatments to be developed and introduced safely into medicine. For example, the first bone marrow transplant was performed in 1957. But it was 30 years before the associated immunity-suppressing drugs emerged and the survival rate of bone marrow transplant recipients began to exceed even 1%. Chemotherapy was another slow-to-emerge treatment that has actually improved with age. The science behind chemotherapy began during post-World War I autopsies. People who had been poisoned with mustard gas subsequently had far too few white blood cells. Even though the gas was a harmful toxin, this prompted researchers to wonder if mustard gas could be used to reduce the excessive numbers of white blood cells in leukemia patients. A toxin as a treatment. The very first chemotherapies emerged three decades later in 1948 and were used to treat children with leukemia. 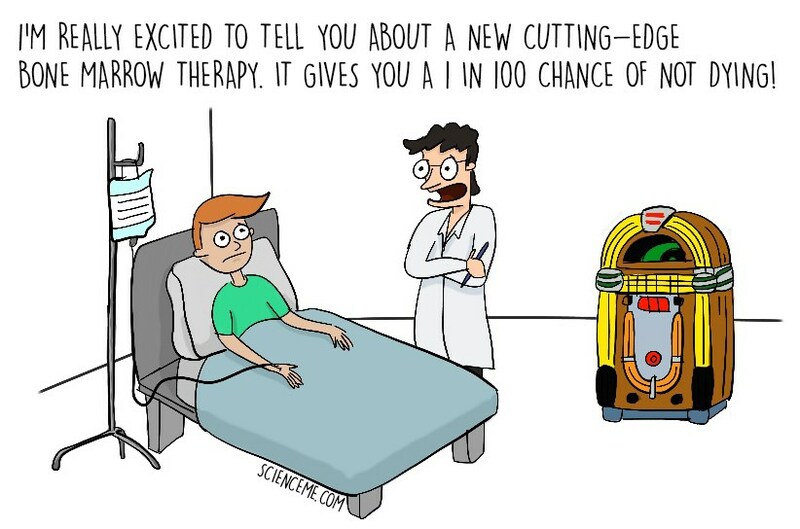 By the 1980s the cure rate was 60-70%, and by the 1990s it was 85-90%. That’s 75 years from the initial concept to reliable treatment. Gene therapy – first dreamed up 60 years ago – is turning out to be no different. Your DNA resides in the nucleus of every single cell in your body. This means that every cell comprises 46 chromosomes, containing 20,500 genes, which code for around 100,000 different proteins. If that’s a string of alien words to you, check out How Does DNA Work? before reading on. It’s really interesting. The only exception to this rule are gametes (egg and sperm cells), which each contain half the number of chromosomes (23 per cell). When they come together, the offspring then possesses half of its mother’s chromosomes and half of its father’s chromosomes. Inherited diseases occur when a gene (or genes) mutate and this faulty bit of code is passed on via the egg or sperm. Mutated genes may no longer code for their original protein, which can sometimes be a good thing, but can also leave the body vulnerable to disease because there are many different proteins critical to healthy biological function. This was the case for four-year-old Ashi DeSilva who, in 1990, was the first human being ever to receive gene therapy. Ashi had adenosine deaminase (ADA) deficiency. Babies born with this rare immunodeficiency disease don’t have the genetic recipe to produce the protein enzyme ADA. Her body was unable to perform a key biochemical reaction that otherwise provides protection via an immune response from most bacteria, viruses and fungi. Most infants with ADA deficiency don’t survive past their second birthday. Ashi was lucky. After her diagnosis she was put on enzyme replacement therapy – a treatment developed in the 1980s in which ADA was taken from cows and linked with polyethylene glycol, or antifreeze, for infusion into the bloodstream. Although expensive at $250,000 per year and only partially effective, at least the enzyme therapy helped keep Ashi alive into her preschool years. When her white blood cell count started falling again, a gene therapy trial – the very first of its kind in humans – looked like her only hope. Here’s how doctors carried out the gene therapy on Ashi DeSilva. Step 1. Insert target genes into the viral vector. Doctors took ADA-producing genes from a healthy volunteer and inserted them into an engineered retrovirus. 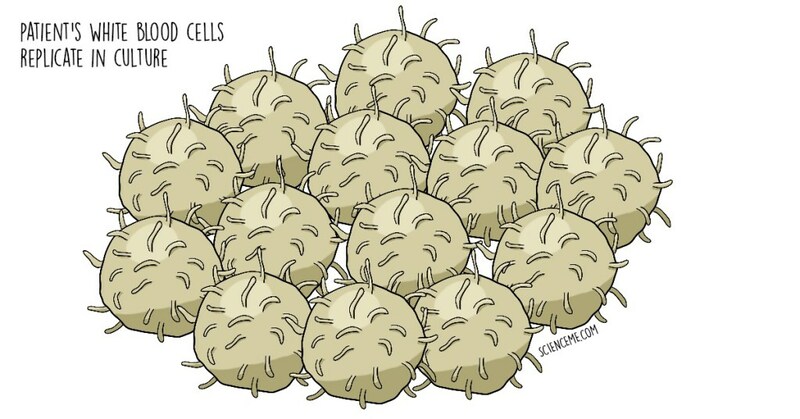 Viruses are pretty basic biological machines with just a shell and a squiggle of DNA inside. Scientists still can’t agree if they’re living or non-living, since they meet so few of the criteria for life. Nonetheless, viruses hijack the machinery of living cells to reproduce and spread themselves (the “virus” part) and some of them even insert their own DNA in among your DNA (the “retro” part) so they become a part of you forever. In gene therapy, the virus is relieved of its own DNA, so it simply acts as a transport vector for healthy gene payload. Besides being able to cure horrible diseases, this is the coolest part of gene therapy because we’re hijacking the hijacker. Step 2. Replicate the patient’s white blood cells. At the same time, doctors took a sample of white blood cells from Ashi and placed them in a culture to replicate themselves and create more. Lots more. Step 3. 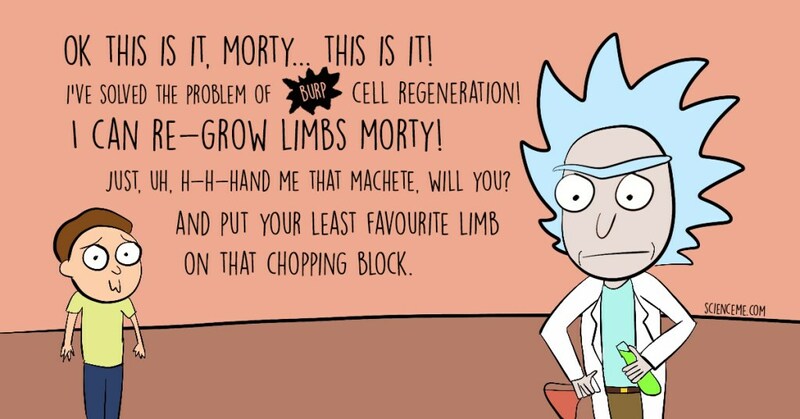 Mix the cell culture with the retrovirus. The next stage is to combine the virus with the patient’s cell culture. In Ashi’s example, the retrovirus attacked the white blood cells because that’s what viruses do best. They injected the healthy ADA-genes into the blood cells en masse. When the gene insertion is done outside the body like this, it’s called ex vivo (“ex” = outside, “vivo” = life). Step 4. 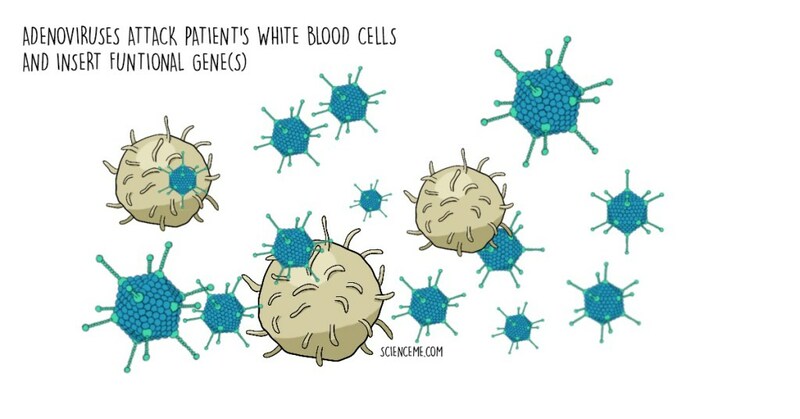 Return the modified white blood cells to the patient. Finally, a pint or so of murky fluid containing around 10 million of Ashi’s genetically modified white blood cells was returned to her bloodstream. The infusion took just 28 minutes. Below is an actual drawing made by a nine-year-old girl who was treated with the same gene therapy shortly after Ashi, also for ADA deficiency. Today, Ashi is alive and well. She’s a 30-something married woman with a master’s degree in public policy. After the therapy, Ashi had no side effects, and continued to improve over 11 gene infusions during the next two years. Her blood showed more corrected T-cells and more ADA production. Thanks to the genetic modification, she began making her own antibodies to protect against infections, and her treated cells were even outliving the ADA-deficient ones. The results prompted researchers to treat newborn babies with ADA deficiency in the same way. They could even take blood straight out of the umbilical cord and enable infants to produce their own ADA from the start of their lives. Ever since, gene therapy trials have forged ahead. Two-thirds of them take place in the US, followed by the UK and Germany. But even in 2018, nearly 30 years after the initial trial involving Ashi DeSilva, gene therapy is still an experimental technique requiring greater refinement and proof of safety in its many forms. Most gene therapies are now aimed at targeting cancer because of its widespread incidence and money-making potential. The second most popular target for gene therapy is monogenic disease, or any disease caused by a single-gene mutation, eg cystic fibrosis. Therapies for cardiovascular disease, infectious disease and inflammatory disease come after those. 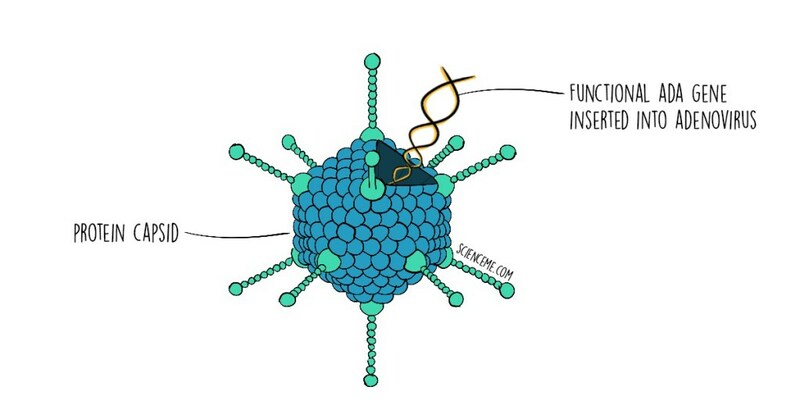 Two different vector systems are used in gene therapy today: viral and non-viral. Retrovirus and adenovirus are still among the top used in viral vectors. Non-viral vectors include chemical and physical systems like cationic liposomes, particle bombardment, electroporation and ultrasound. These are less efficient but their availability and cost-effectiveness make them extremely useful. In fact, the largest challenge faced in gene therapy is how to deliver the new genes into the patient’s cells. Different cells are responsible for different jobs, and only a subset may be involved in disease (for example Ashi’s white blood cells) so gene therapy need only target the affected cells. However, when a virus is introduced, the body responds as a whole with an immune response, which can be life-threatening. This was the case for 18-year-old Jesse Gelsinger in 1999, who died unexpectedly during a gene therapy clinical trial. There are other vector problems too, including dose-related toxicity, pre-existing neutralising antibodies, and insufficient gene expression. Researchers are working to re-engineer next generation viruses to ensure the safety and efficacy of gene therapy. For all its successes and setbacks, gene therapy is considered a very promising treatment for numerous disabling and otherwise incurable diseases. Investment is growing and regulators are creating specific rapid access paths, providing hope for doctors and patients. One day, thousands – even millions – of people may owe their lives to gene therapy. A version of this post was originally published on ScienceMe.com. Becky Turner is a New Zealand-based writer, former financial journalist, and is currently studying toward a degree in Zoology.